These plants are native to North America, Europe, and temperate zones of Asia, this particular variety is native to shady areas in Big Bend. It is a clump-forming perennial that is grown not only for its flowers but also for its fern-like foliage. These plants flower during cooler weather and thus flower during late spring and early summer. The flowers are bell shaped with a spur on the bottom. This plant is frost hardy and prefers a sunny location with some shade to protect them from the heat of the summer. Some varieties self-seed. Aquilegia chrysantha var. 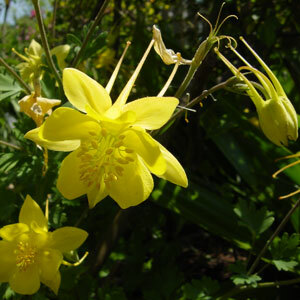 hinckleyana ‘Texas Gold’ is a yellow variety of the bell-shaped flower and has great heat tolerance for a columbine.